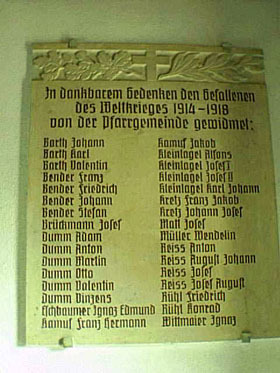 32 men are listed on the above plaque in the entrance hall of the St Nickolas Catholic Church in Rettigheim as having been killed in The Great War. At this point in time, 24 of those were our Bender ancestors. The 7 of the 8 surnames of the remaining 8 not yet connected to our Bender family make it very easy to guess that all on the plaque were our ancestors. The 8 not yet connected are: Johann Bender, Josef Bruckmann, Anton Dumm, Anton Reiss, August Johann Reiss, Josef Reiss and Ignaz Wittmeier. Josef Mott or Mall is the one that may not be linked to our family.